Do yall ever just feel so exhausted you feel like making dinner is equivalent to climbing Mt. Everest? That’s how I felt yesterday after doing 4,573 piles of laundry. I was actually buried alive there for a little bit and things got iffy, by I made it out ok. 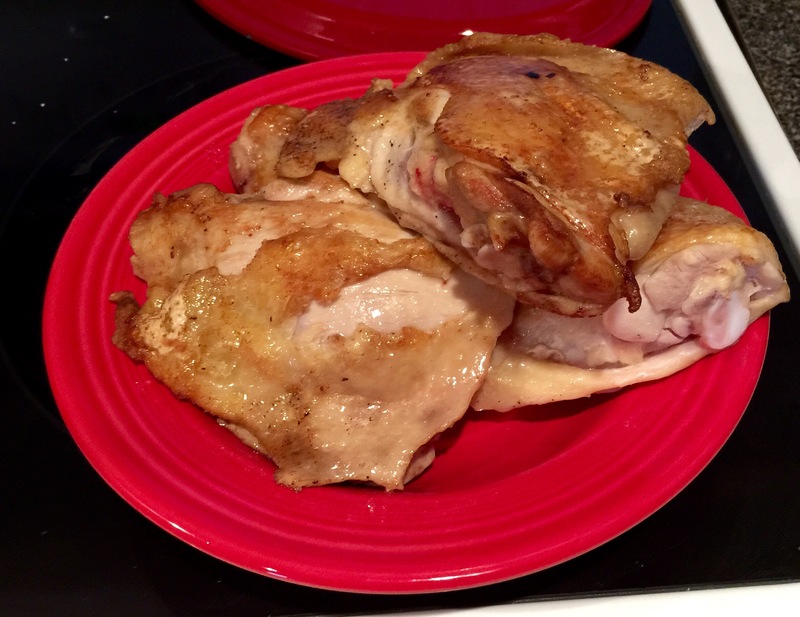 I was craving my other BBQ Chicken, but as I said before, I had no energy and no ability to baste my chicken because I knew my arms would fall off. 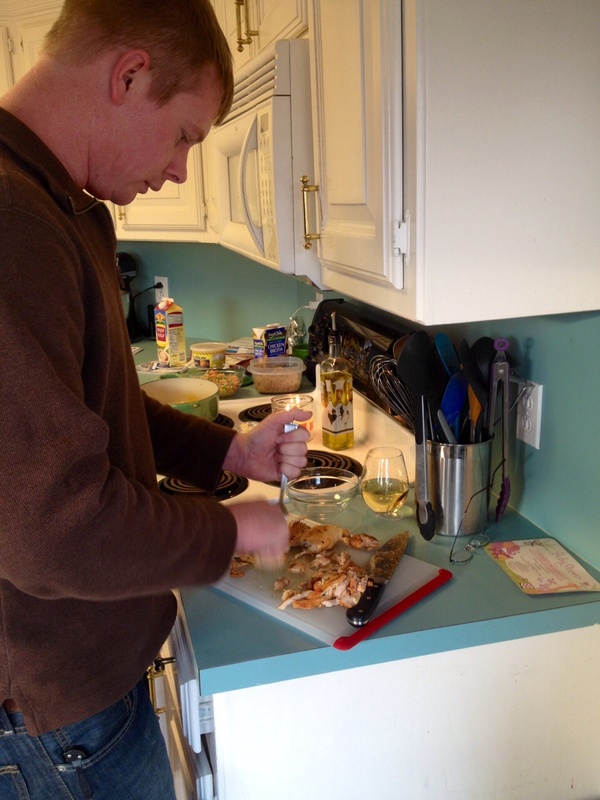 So I did it this way instead, and it was just as delicious and very easy to do! 1. 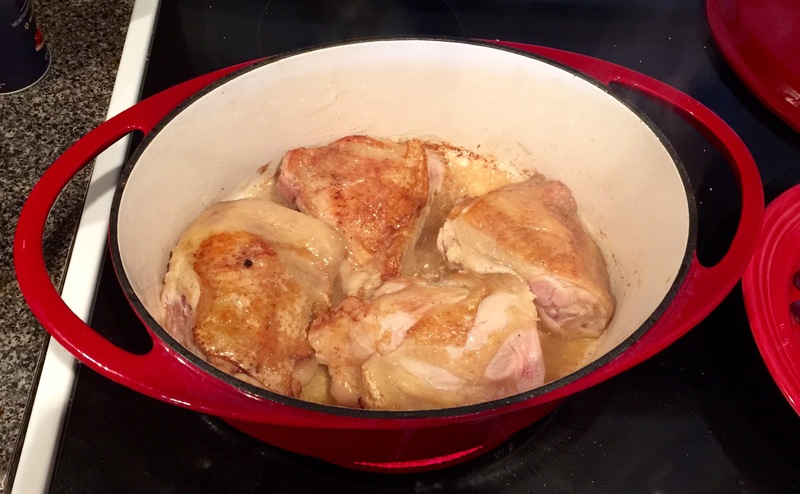 Melt your butter in a heavy duty Dutch oven and once it’s hot, place your chicken skin side down to get a nice sear on it. Make sure to season it with salt and pepper. Flip it over after a few minutes and then set it aside. It’s far from cooked, but we just want to get the skin crispy for later. 2. Now toss in your onion and turn the heat down a bit if you need to. Again, season it with salt and pepper and cook it 15-20 minutes or until they’re golden and cooked through. 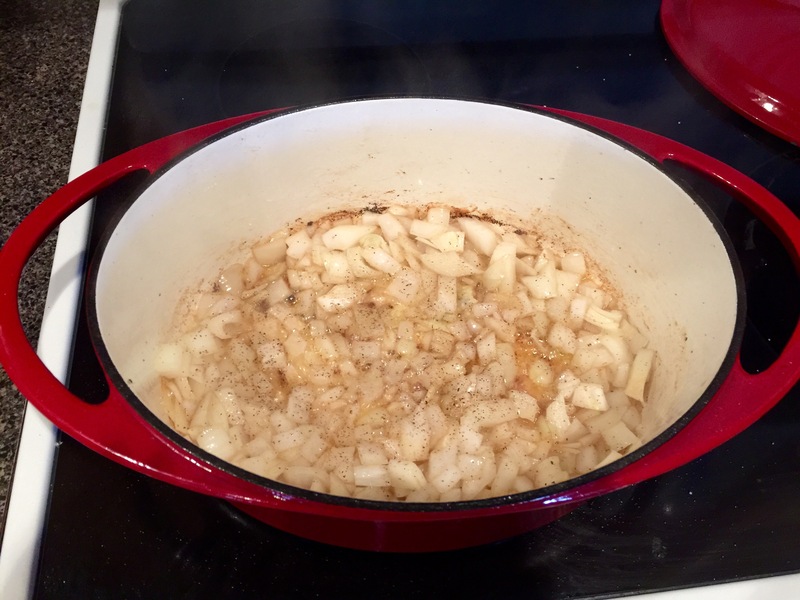 Toss your garlic in there during the last five minutes. 3. 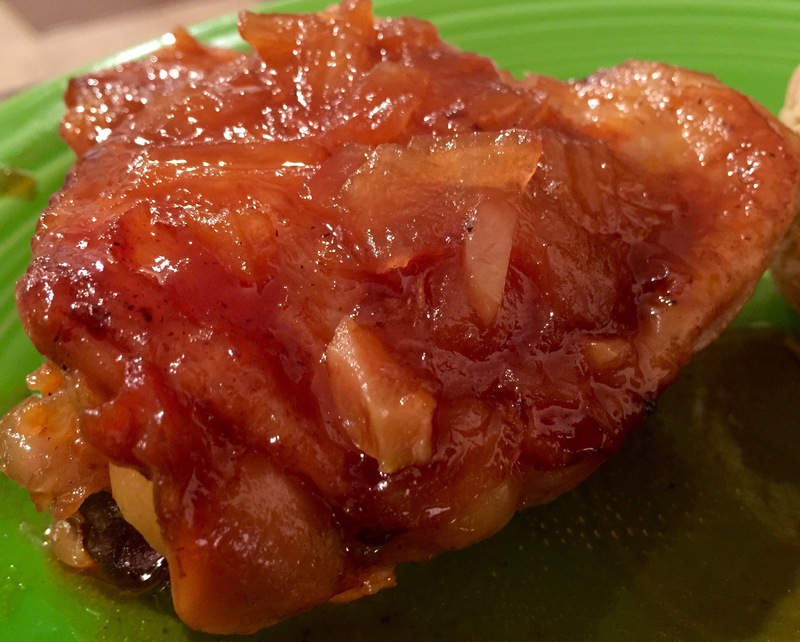 After that’s all cooked, add your cup of BBQ sauce and apricot jam into it and stir all together. Turn off the heat. 4. 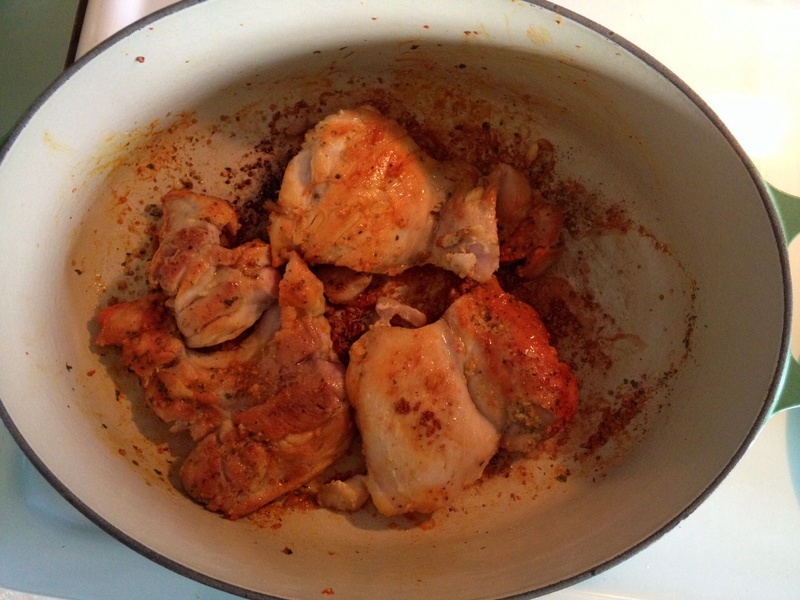 Now lay your chicken in there with the skin side up, put the lid on it, and set in your oven at 325 for one hour. 5. Now it’s done! 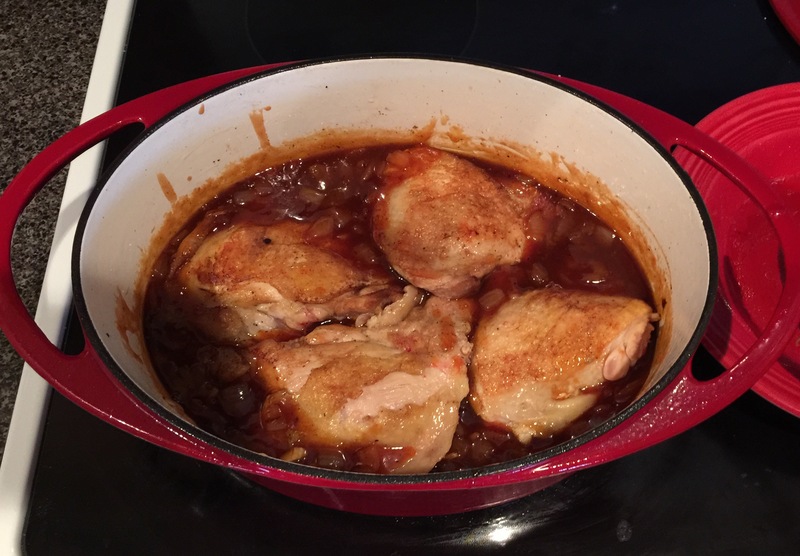 If you don’t have a Dutch oven, but you do have a slow cooker, you could do all the cooking on your stovetop in a skillet (preferably cast iron) and dump it into your slow cooker on high for 4 hours or low for 8. We had ours with baked potatoes and it was perfection! 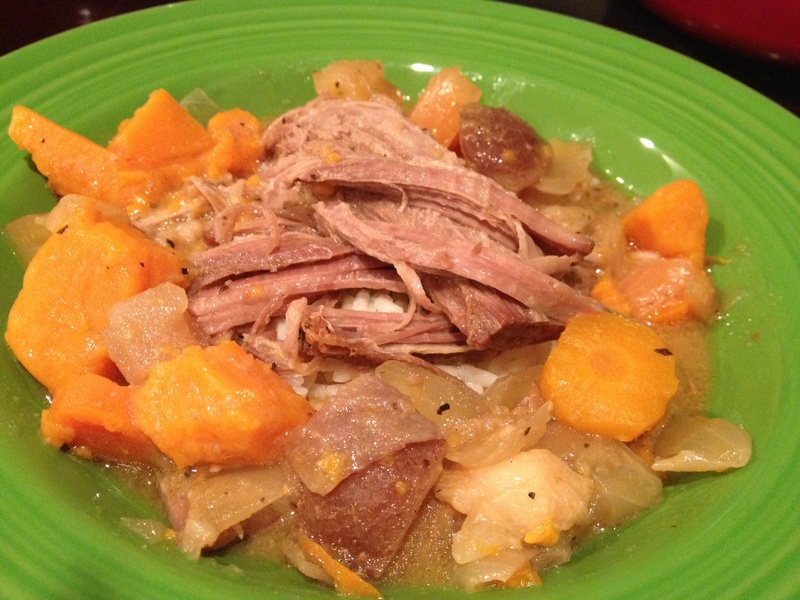 I love easy dinners like this pot roast you can just throw in all one dish and let it cook away all day! 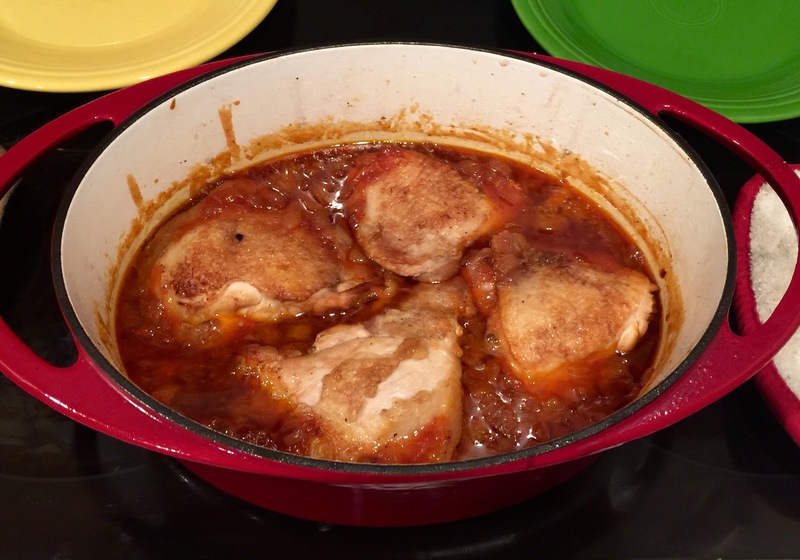 I made mine in the oven only because I wanted to use my shiny orange ovenware dish, but this works perfectly in a crockpot too. Crocktober lasts pretty much all fall and winter at my house, and this is one of my favorites. 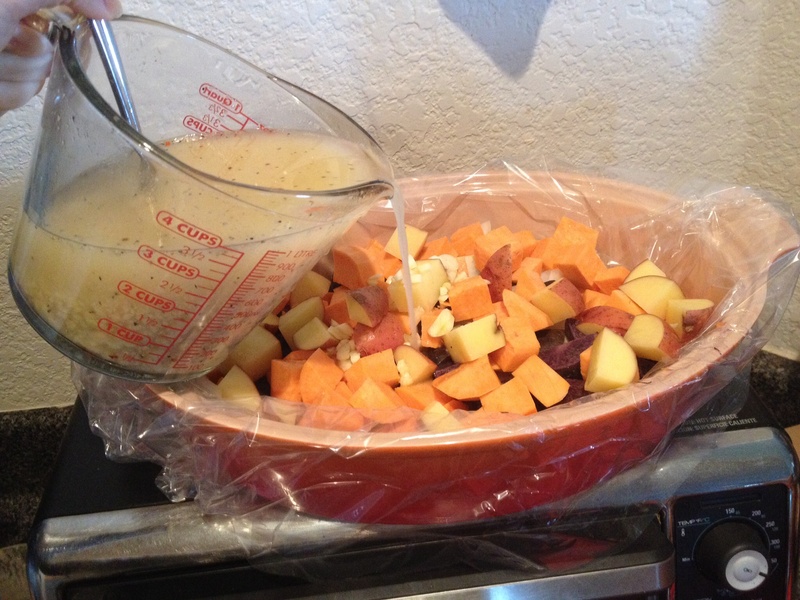 Also, I know some of you may be hesitant about using sweet potato in this recipe, but I promise you it’s so delicious, and once you’ve tried it you’ll never cook pot roast with just plain potatoes ever again! 1. 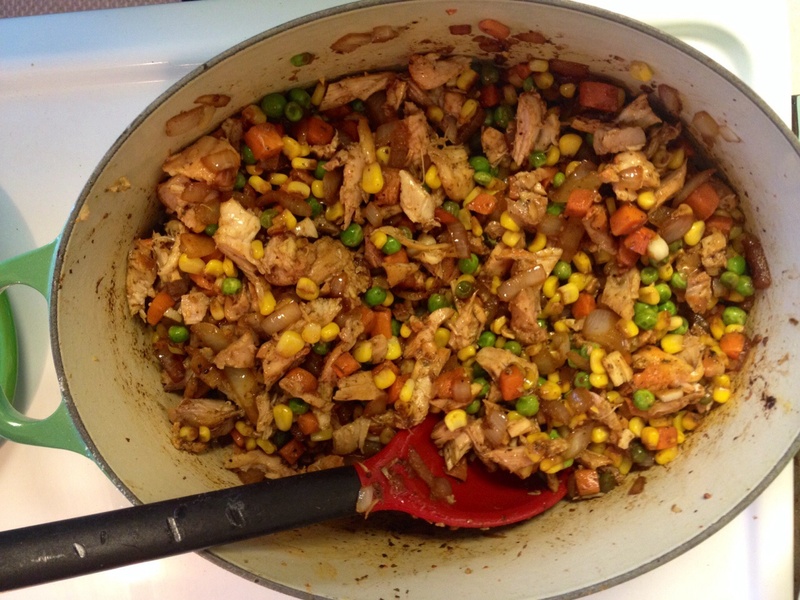 Chop all your veggies and put in your crockpot or casserole dish. 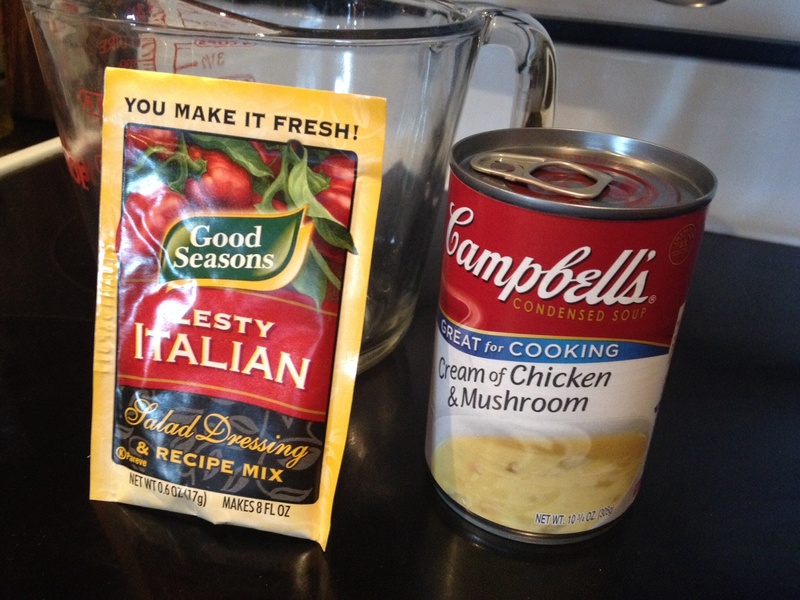 Combine in a separate bowl can of cream of mushroom/chicken, Zesty Italian Seasoning, and 4 c water. 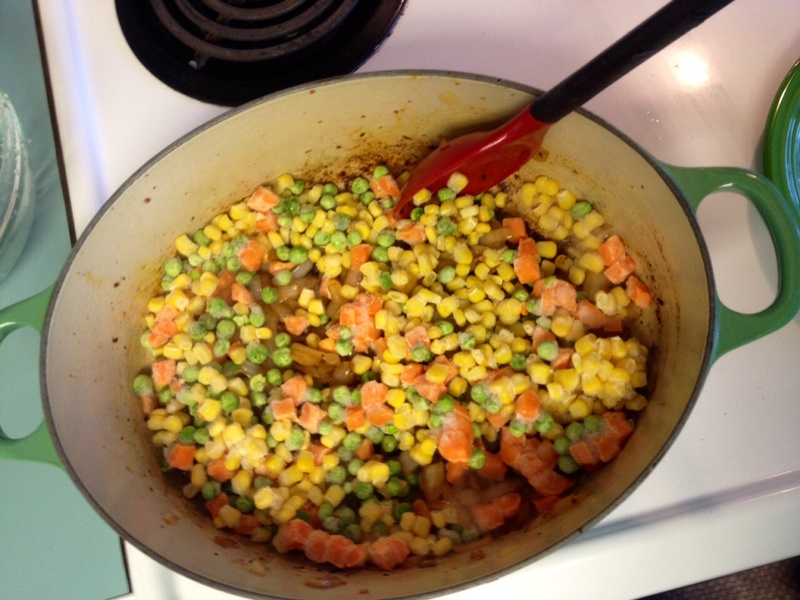 Stir until combined and pour over the veggies. 2. 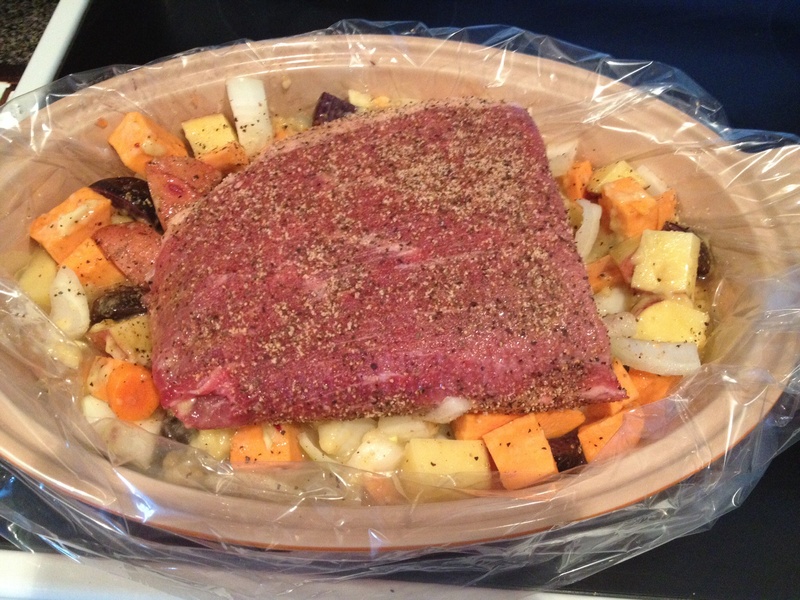 Season pot roast liberally on all sides with your favorite all purpose seasoning and place on top of veggies and cover with lid. 3. 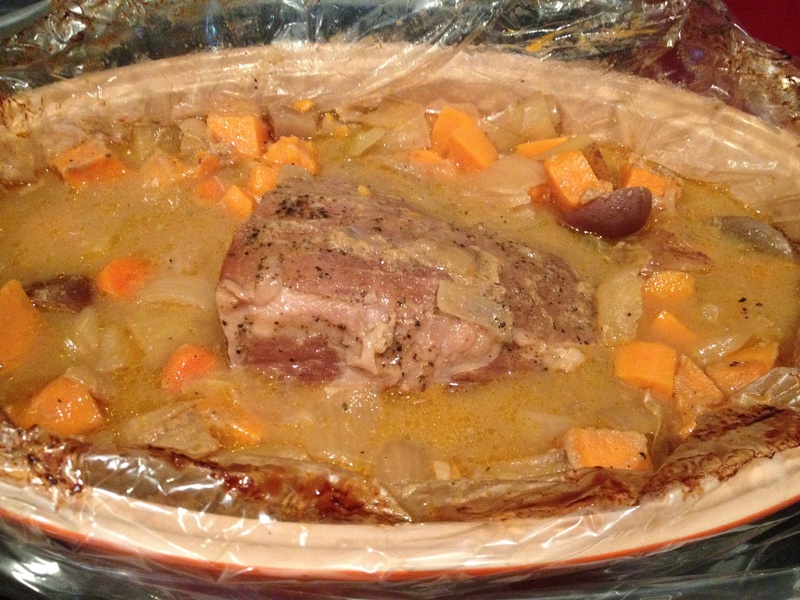 Bake in oven for six hours at 300 degrees or place crockpot on high for 6-8 hours (depending on the strength of your crockpot and weight of your roast). Serve over rice or with tortillas in a pot roast taco for a delicious cool weather meal! 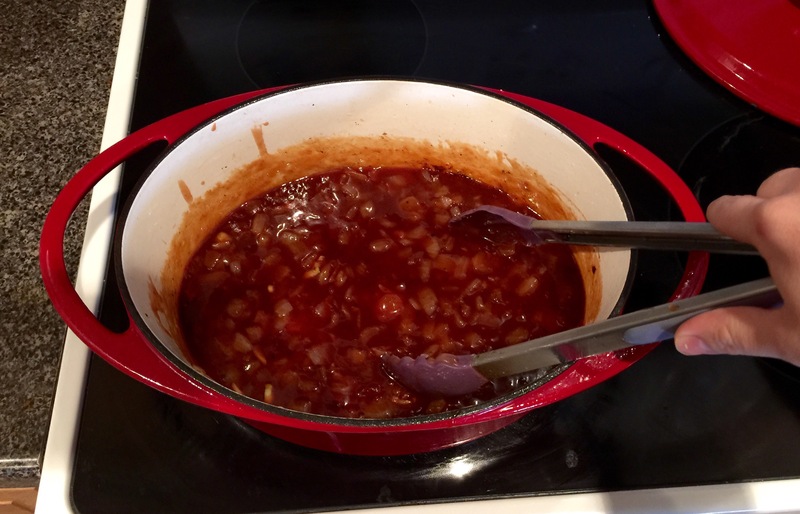 If you’re serving with rice, I like to cook the rice with some of the pot roast liquid after it’s done cooking to give it extra flavor. Yum! Y’all, I could hardly drag myself from my bed with my electric blanky into my bathroom with my personal space heater due to this crazy weather. It’s safe to say I despise the cold, and if I had it my way it would come for Christmas holidays then GO AWAY! 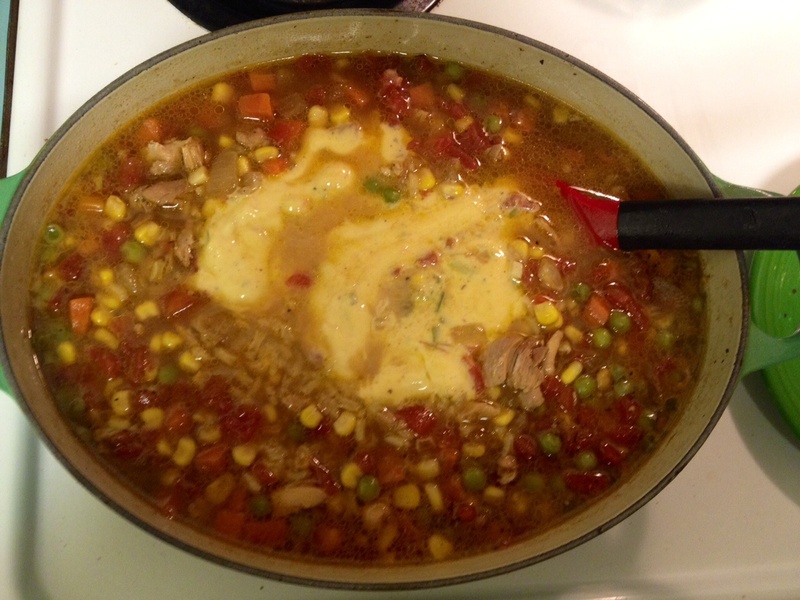 This soup was so yummy and warmed me up long enough so I could build a fire and try to stay warm! 1. 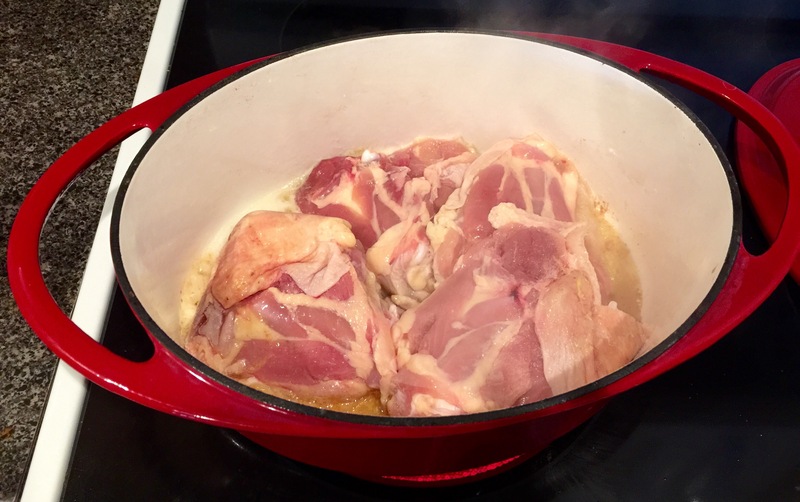 Put your chicken thighs in your soup pot and season both sides liberally with the three GOYA seasonings. Look familiar? It should, this is the same stuff used on my grilled chicken recipe! 3. See all those dark num nums at the bottom of the pot? Mmm, they’ll give us lots of flavor! 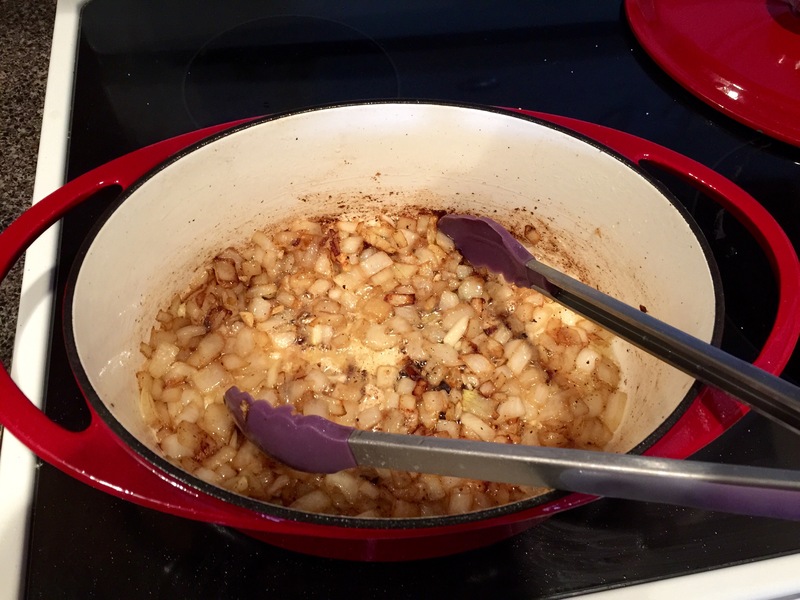 Throw in your onions and add a little olive oil if you need to. 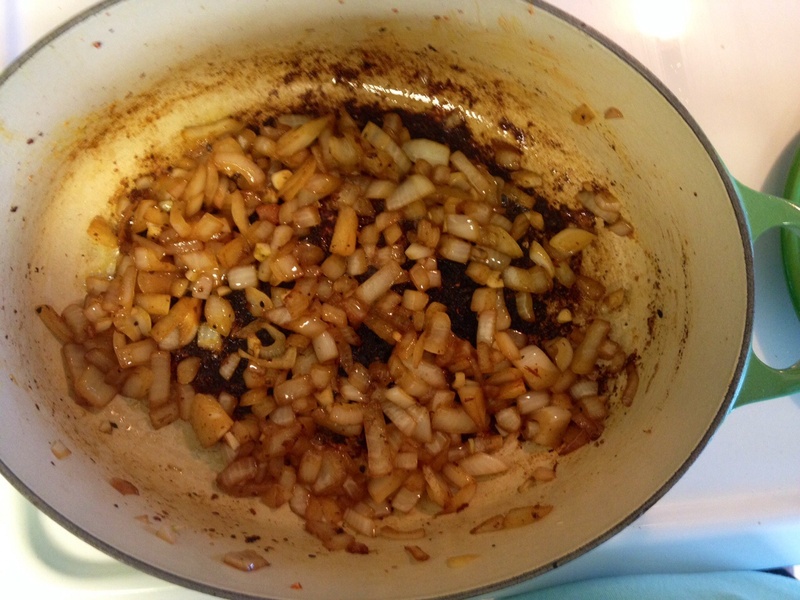 Sauté about ten minutes and then add your garlic in, then sauté another few minutes. 4. 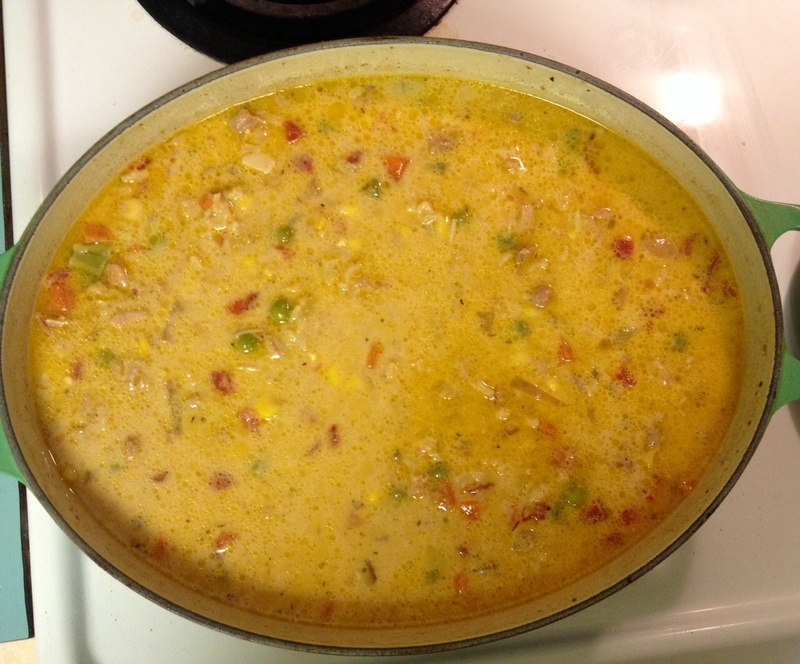 Now add your frozen veggies and Rotel. 5. 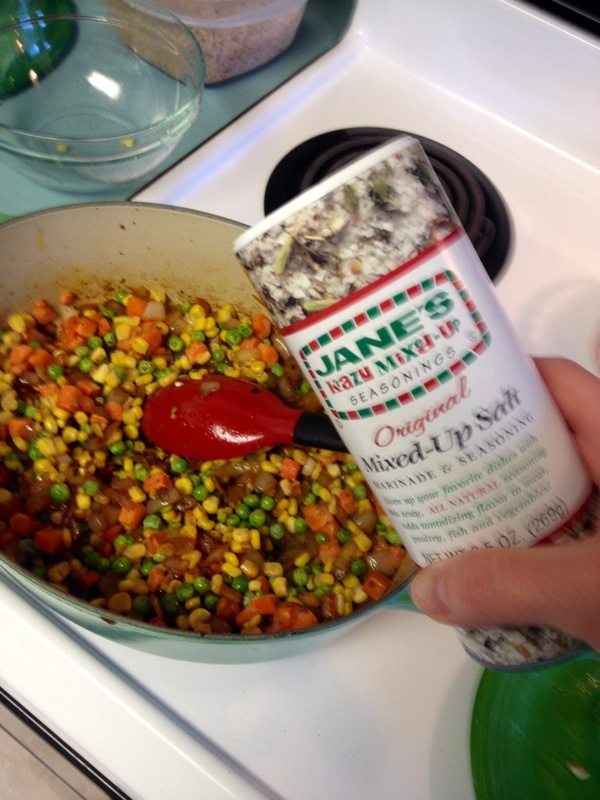 Season your veggies liberally with your favorite season-all. 6. 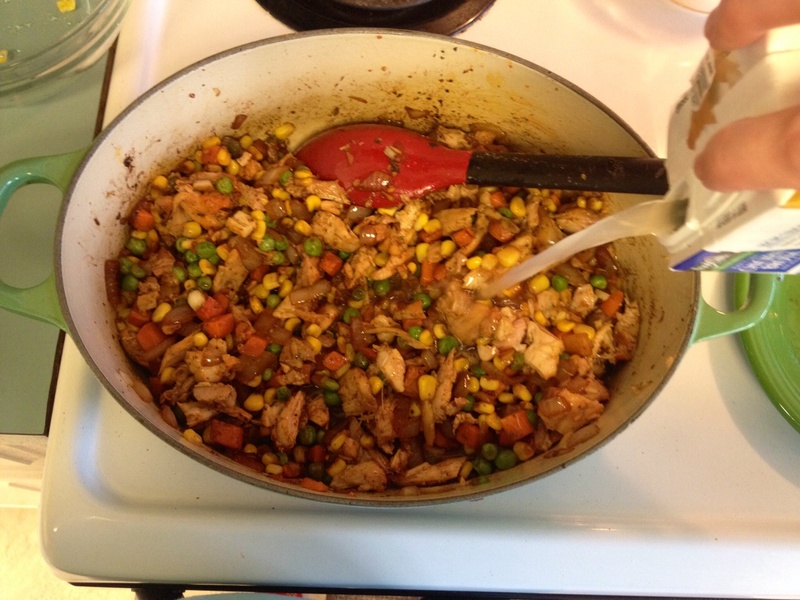 Add your chopped up chicken back to the mix. 7. Add one box of chicken broth and bring to a boil. 8. 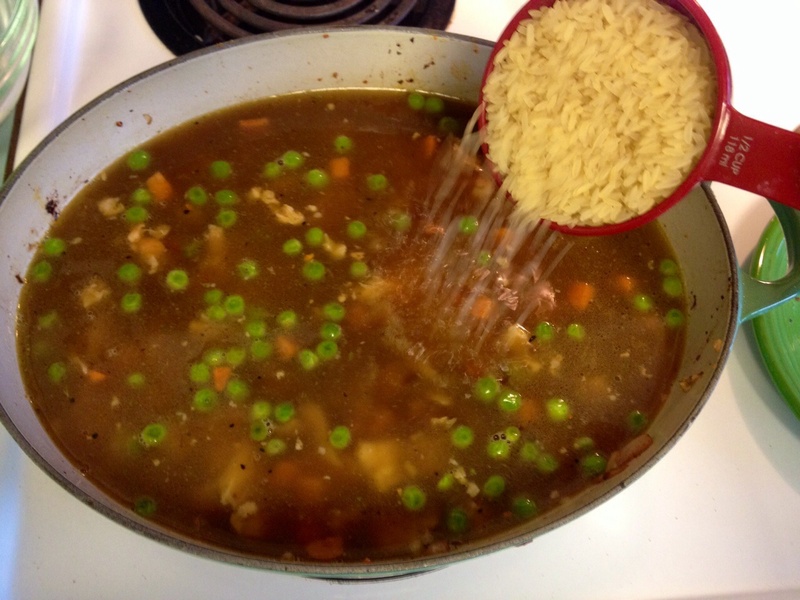 Add your uncooked rice and allow to boil for a minute before turning to a simmer and putting a lid on it for 20 minutes. 9. 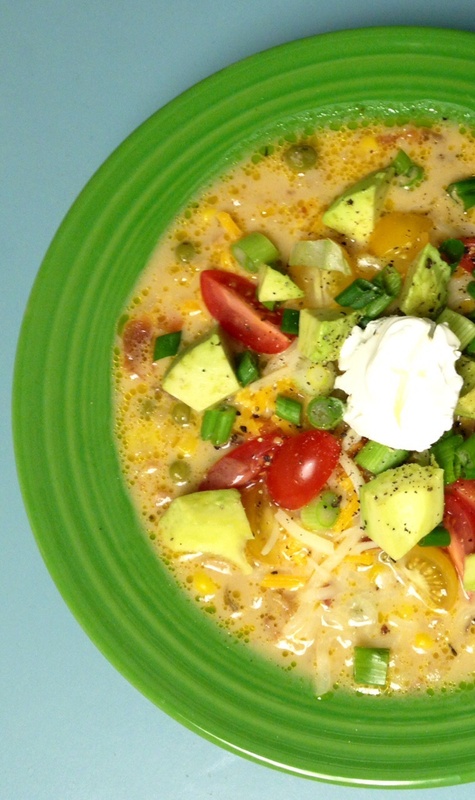 Now add your queso to the soup. Oh my goodness, the cheesy goodness!!! 10. 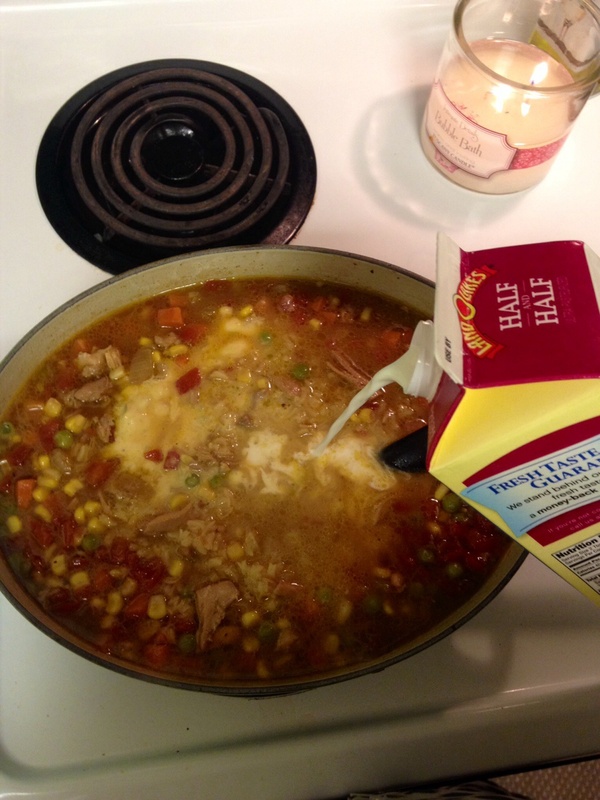 Now give your soup a healthy splash of half and half to balance it all out! 11. Your soup is done! 12. 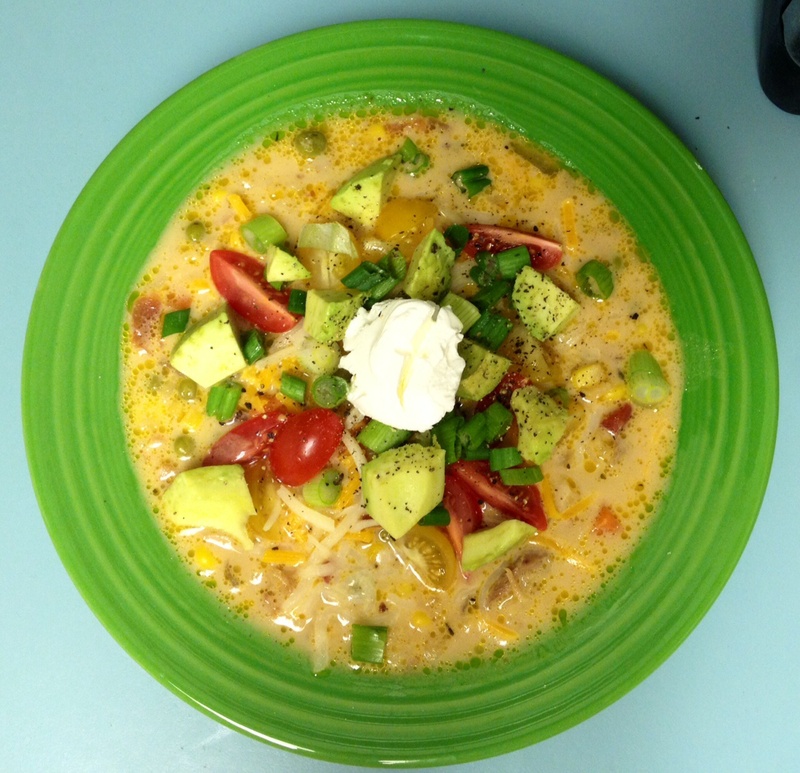 Serve with shredded cheese, avocado, sliced cherry tomatoes, green onion, and a dollop of sour cream! Mmmmmm!! !